And the Good Housekeeping Award Goes To...". Well we have cleaned up some wiring messes in the past and it is often quite amazing to see who these French/ Canadian companies might contract to do their installs, but this one takes the cake. 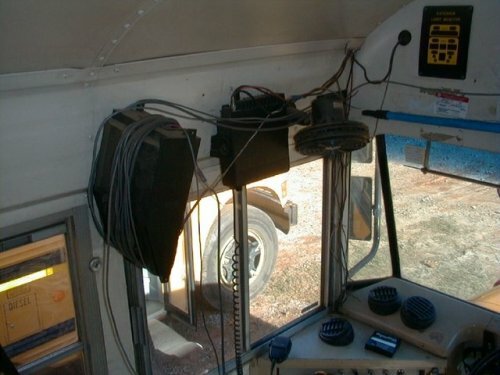 Just because the radio has a 20 foot harness and the old video system had a 20 foot harness and the new video system has a 20 foot harness this does not mean you cannot neatly roll up the extra cable and tuck them inside the VCR lock box, this is hands down the words case of wiring we have ever seen and we have seen some bad wiring.